Black noodles are very tasty, interesting, and impressive. They are made with the black "ink" of cuttlefish. The coral red color of the Alaskan Pacific wild salmon roe, or caviar if you wish, makes a beautiful antitheses in colors almost as interesting as Stendhal's (real name Marie-Henri Beyle) book "Le Rouge et le Noir" in French, the Red and the Black in English. I would like to share with you today this combination of black ink tagliolini with red salmon roe exploding in your mouth when you bite into it which is delicious... a bit heavy on the pocket but worth it when you have a few good friends over for dinner. You should count 50 gr of salmon roe per person. - 500 gr of black tagliolini (thin black tagliatele made with cuttlefish ink). - 50 gr per person salmon roe. - 1 small clove of garlic crushed. - 25 gr of goat's butter (butter made from goat's milk). - 25 gr of fresh cow's milk butter. - Boil the tagliolini to al dente. When the water boils add less salt because of the salty salmon roe, boil the pasta 4 minutes and keep on trying it until it is right. It is important to get the tagliolini right al dente. - Drain, add the two butters together (Maria's idea) and immediately add the pasta. Turn off heat, toss and roll till all the pasta is well coated with the butter. - Transfer pasta to your serving dish. - Quickly scatter the salmon roe. - Serve and enjoy with an equally interesting salad on the side. - ½ head of curly salad cut into its leaves, washed well and dried (by centrifuge is quicker). - 6-8 pieces of pleurotus gilled mushrooms, brushed with oil and lightly grilled al dente. - 1½ red pimentos (sweet red peppers) washed and sliced. - 2 cups of purslane leaves (portulaca oleracea) considered as a weed in the U.S.
- 1/3 cup of vinaigrette. The following is verbatim from Wikipedia on Google. It would be worth while reading. Although purslane is considered a weed in the United States, it can be eaten as a leaf vegetable. It has a slightly sour and salty taste and is eaten throughout much of Europe, the middle east, Asia, and Mexico. The stems, leaves and flower buds are all edible. 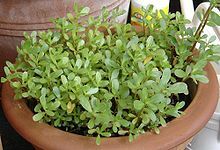 Purslane can be used fresh as a salad, stir-fried, or cooked like spinach, and because of its mucilaginous quality it is also suitable for soups and stews. Australian Aborigines use the seeds to make seedcakes. Greeks, who call it andrakla (αντράκλα) or glystrida (γλυστρίδα), fry the leaves and the stems with feta cheese, tomato, onion, garlic, oregano, and olive oil. Purslane contains more omega-3 fatty acids (alpha-linolenic acid in particular) than any other leafy vegetable plant. Simopoulos states that Purslane has 0.01 mg/g of eicosapentaenoic acid (EPA). This is an extraordinary amount of EPA for land-based vegetable sources. EPA is an Omega-3 fatty acid found mostly in fish, some algae, and flax seeds. It also contains vitamins (mainly vitamin A, vitamin C, and some vitamin B and carotenoids), as well as dietary minerals, such as magnesium, calcium, potassium, and iron. Also present are two types of betalain alkaloid pigments, the reddish betacyanins (visible in the coloration of the stems) and the yellow betaxanthins (noticeable in the flowers and in the slight yellowish cast of the leaves). Both of these pigment types are potent antioxidants and have been found to have antimutagenic properties in laboratory studies. 100 Grams of fresh purslane leaves (about 1 cup) contain 300 to 400 mg of alpha-linolenic acid. One cup of cooked leaves contains 90 mg of calcium, 561 mg of potassium, and more than 2,000 IUs of vitamin A. A half-cup of purslane leaves contains as much as 910 mg of oxalate, a compound implicated in the formation of kidney stones. However, note that many common vegetables, such as spinach, also can contain high concentrations of oxalates. When stressed by low availability of water, purslane, which has evolved in hot and dry environments, switches to photosynthesis using Crassulacean acid metabolism (the CAM pathway): At night its leaves trap carbon dioxide, which is converted into malic acid (the souring principle of apples), and, in the day, the malic acid is converted into glucose. When harvested in the early morning, the leaves have 10 times the malic acid content as when harvested in the late afternoon, and thus have a significantly more tangy taste. - Chose a nice flat platter for your salad and lay your curly salad around the edge. - Throw your two cups of purslane in the center. - Arrange your red sliced sweet peppers around the purslane. - Finally add your pleurotus mushrooms where ever you can. - When time to eat the salad, add the vinaigrette sauce and toss.